There are vending machines every where in Japan. The drinks have every thing from juice to beer and saki. When asked about the teens buying the hard drinks out of the vending machines it was explained that it would never happen. That it was such a dishonor for them to do that. The same with the cigarettes machines. What a difference from the US. 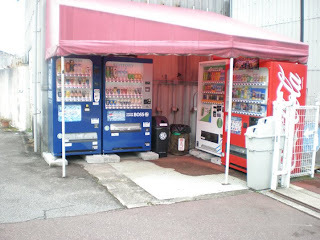 A typical vending machine with recycle bins. They recycle everything! Oh, if only American teens thought the same way!--or some of the parents for that matter!